Let me now step through each one of these issues to help you determine if it is a factor in your situation. The first question I always ask when de-tracking problems are reported is – was the machine converted from steel tracks to rubber tracks? The reason for this is in my experience, insufficient track spring tension is the most common cause of this problem. Many manufacturers of mini-excavators including Komatsu, Hitachi, Kubota, Kobelco have track adjuster assemblies with two tension settings; tight for rubber tracks and loose for steel tracks. The reason for this is that there is no stretch in steel tracks, therefore the adjuster assembly has to be tuned with enough give to relieve tension build up if any material is caught in the track. Rubber tracks however, due to their design and construction have a certain amount of inherent flexibility and typically run a much tighter spring tension. Therefore, if the machine has been converted from steel to rubber tracks (without the spring being tightened), the track spring is worn and has lost tension or has broken; you are likely to experience de-tracking problems. A simple but effective way to identify this as a problem is to perform the following test. Lift the machine off the ground (using bucket and blade) and jump on the bottom edge of the track. Whilst you are jumping get someone to carefully watch the idler and measure the amount of retraction. If the idler is retracting more than 5mm under the weight of a person – imagine how much it will retract with the weight of the excavator. This retraction causes temporary track slackness which will often result in de-tracking. Particularly at the idler end. Another common cause of de-tracking is leaking or bypassing track adjuster seals. This can be caused by a bent, scarred, rusted or contaminated (often by concrete set on the exposed rod) adjuster piston. This causes the track to slowly come loose over time, the resulting slackness provides the perfect conditions for de-tracking. The easiest way to eliminate this as a causation is to tighten up the offending track first thing in the morning, then regularly monitor during the day whilst working. If the tension has noticeably dropped off, then I would highly recommend pulling the adjuster out for examination. Probably the first and easiest problem to eliminate. Do all rollers rotate smoothly and are not loose and wobbly? Are the roller flanges still distinct and upright, not rounded off?? Does the idler still have a prominent and straight sided centre guide flange and tight bushings without excess slop? Worn sprockets is another possibility and often harder to diagnose. Feel free to request a photo of new sprockets at any time to compare with the existing, this is often the best way to gauge how much wear is evident. All of these can cause issues with keeping tracks on, although unless particularly bad are usually a contributing factor rather than the sole cause. This is an interesting one. With all the grey imports on the market these days, it is often very difficult to know exactly what you are dealing with. 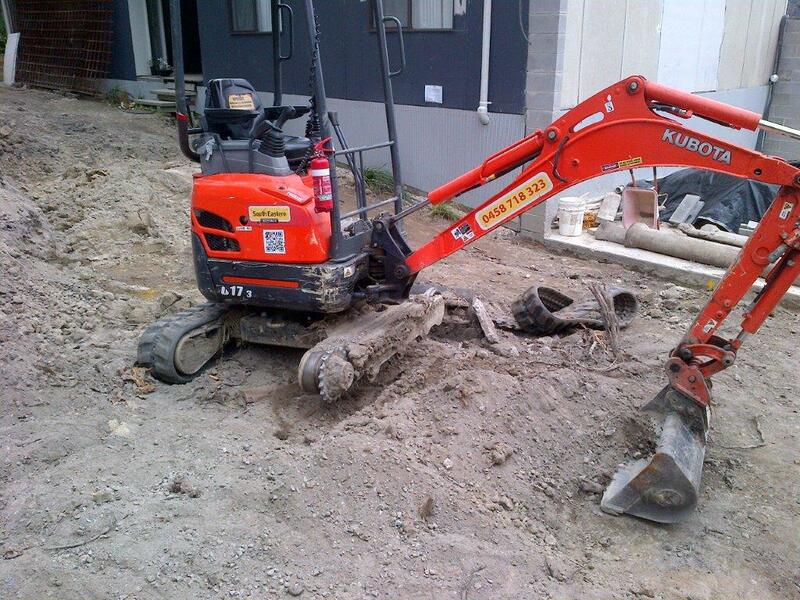 Just because the sticker says it is a common model Kubota 5 tonne, doesn’t always mean that that is what you have got. This coupled with the many fly-by-night backyard rubber track importers is a recipe for disaster and a common cause of grey-hairs, and de-tracking is only one of them, believe me!! Don’t drive over it – move it. You have a bucket, shift rocks, rubble etc out of your way rather than tracking straight over. Don’t turn on side slopes or when tracking over a pile or a curb. Take your time – a few seconds more of tracking could save you an hour re-fitting a track. Track turn – don’t skid turn. Turn a wider radius ensuring both tracks are moving, rather than just using one track to turn. This causes less buildup of rubble in your tracks. The worst operating conditions for rubber tracks are heavy mud, heavy sand and or gravel. These conditions tend to cause a buildup of soil/rubble inside the track which is then compacted by the rollers and sprockets. If you are not careful, the tension builds up and up until bang, the track is off before you can blink. A couple of tips to avoid this include regularly lifting your machine up off the ground and tracking at high speed. This helps clear the tracks. Please remember that this compacted material in the track can cause a massive increase in track tension, resulting eventually in reduced track life. It also pays to back the track tension off substantially by letting grease out when in these conditions to avoid this buildup of pressure. Side slopes are another condition which can cause de-tracking. Especially if the spring tension is a bit soft and/or the undercarriage is worn. It is always best to work up and down a slope rather than side-to-side. Yes it is always the tracks that get blamed first. However, in my experience, it is fair to say that it is rarely a track fault – but it can and does happen. If the cables inside the track are broken, then the track will tend to flex excessively and ride off the sprocket or idler. We are seeing more and more light-weight Chinese tracks on the market. As a result you are going to hear more and more about de-tracking issues in the future as many of these tracks do not have the integral rigidity to stay straight when operated in the tough conditions mini-excavators are put. I guess whether this is a track fault or track quality problem depends on which side of the fence you are standing. Please remember, there is mostly a reason why a track is so much cheaper than the others on the market. De-tracking problems can just be one of them. I guess the first question we always ask is – is it both tracks or just one side that is coming off. If it is just one track then we recommend swapping them left to right. If the problem continues on the same side it is definitely not the track at fault. Whereas if the same track continues to come off on the opposite side, then we have most likely identified the problem and the track is likely at fault. Feel free to contact any one of our technical team at any time with any questions regarding rubber track de-tracking problems. Even if we did not supply the tracks, we are always looking to increase our knowledge and will do our best to help you isolate the problem.